It’s here! Windows 10 has officially launched, six months after we first shared how Dell was preparing to enter the next era with Microsoft, and just a bit over a month from when we started taking pre-orders, and one day after we actually started shipping Windows 10-installed devices! Yes, through that close partnership, many who took advantage of our pre-sale, will have their new systems in their hands on the same day as launch. And, we aim to offer more systems than any company online and through retail partners today. But, what if you already have a Windows device? Don’t worry, we’ve worked with Microsoft to make it quick and easy to upgrade an existing PC. Our proactive service and support options including ProSupport Plus and Premium Support will keep commercial and consumer customers up and running easily while maintaining the health of their systems. 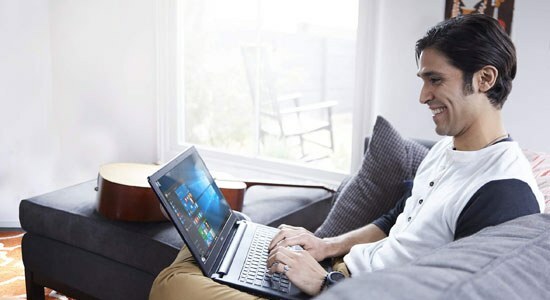 To help all customers make a smooth transition to Windows 10, our Dell Support team is publishing a series of videos that cover topics including how to upgrade to Windows 10, key features, basic functions of the new OS, and how to use the OS on virtual desktops. Additional videos will be coming, and the topics will be based on our customer conversations and questions received across phone, chat and social media support teams. Hosted on the Dell YouTube channel, the videos are available in English, Spanish, French, Portuguese, Chinese and Japanese. And, for those who like a good flow chart, we’ve also worked with IT community Spiceworks to create an infographic to help you determine if you can upgrade to Wondows 10 for free. You can find it, along with additional useful information, on Spiceworks and embedded at the bottom of this post. To keep the excitement going, we are co-hosting with Microsoft a #DellLounge Powered by Windows 10 event in Chicago from July 30 through August 2. I’ll be flying up tomorrow to help share the event with those who can’t come through real-time updates on Twitter and Instagram. Not only will we be bringing the new features to life on our latest Windows 10-ready devices through interactive experiences and learning labs, there will also be entertainment including two guys generating quite a bit of excitement. “We’re just two kids from Nebraska,” Jack and Jack share in our New Experts series, but their YouTube and Vine escapades have built quite a fan base that has been tweeting @Dell almost every day since their commercial with us first started airing in U.S. movie theaters. The New Experts series features the new thinkers and doers who are taking learning and sharing to a whole new level. Other names you may have heard of at this week’s event will include Morgan Page, A-Trak, Residual Kid, Mahogany Lox, Josh Leyva, Hunter March, ChimneySwift11 and Jared Eng of Just Jared. Microsoft has also kicked off a new initiative called Upgrade Your World that we will be highlighting at the event through engaging programming and demonstrations celebrating the people and organizations making a difference around the world like Goodwill® Industries, Girl Scouts of the USA, Academy for Global Citizenship and more. Upgrade Your World is a year-long initiative designed to celebrate those who inspire and empower others, led by a vision to help people achieve more through technology and in celebration of the Windows 10 launch. You can follow the conversation at #upgradeyourworld or #learnitshareit on @Dell, @DellHome and @Windows. I have found that Dell has not prepared well for legacy laptops (Inspiron 15r (n5110) as there are no bios updates to support win 10. A laptop that is less than 4 years old that cannot be upgraded to a new OS is a real bummer considering what I paid for that laptop. Not very customer focused on this one. I have a Dell 7000 laptop with a Dell 3000 USB expansion system for attaching remote displays, and my Ethernet cable. On upgrading to Windows 10, none of the remote displays worked, so I have been downloading drivers and finally they are working, but the Ethernet connect is not working, even through the lights are flashing on the D3000. I have run diagnostics and it says the Ethernet cable is not connected. It is cinnected. Will Dell be releasing Windows 10 drivers for the D3000, if not what options do I have. I only purchased the laptop and D3000 6 months ago. I checked the file library at Support.Dell.com and didn’t find any Windows 10 drivers listed for the Dell 3000 USB 3.0 docking station. This could mean either that the docking station isn’t compatible with Windows 10, or simply all needed drivers are already included in Windows 10. Does the notebook detect the network adapter on the docking station; if not then Windows 10 drivers will likely be needed. Click the start button, settings, then Network and Internet, click Ethernet on the left side, and change adapter options. It can have three or more connections listed here, the integrated network adapter, the wireless adapter, and hopefully the docking station adapter. If the adapter is listed you can further troubleshoot by right clicking on it and clicking Status, where you can check both IPv4 and 6 connectivity, media state, and if the adapter is sending or receiving any bytes. You can also click the diagnose button for further help. At least find out if this is a Win 10 driver problem or another issue. Here is a link to a document listing the Dell systems that have been tested to be compatible with Windows 10 and unfortunately the Inspiron 15r n5110 isn’t included. This isn’t to say that Windows 10 will not work on the 5110. There have been a number of folks posting on the Dell Community Windows 10 forums that were able to get Windows 10 up and running by upgrading the system BIOS to rev A11. Take a look at the forums and try upgrading the BIOS and see if it works out. When will Dell release driver to windows 10? I have had many generations of Dell product. However, due to the fact that Dell has let me down by not making the Inspiron 15R (N5110) easily to upgrade to Windows 10 leaves me to abandon my loyalty to Dell. I would hope that with all the customer feedback on this oversite that Dell will reverse it's decision to not take care of N5110 owners. @krejba – Most OEMs require driver support from the manufactures of the chips like audio and networking. They generally will stop supplying updated drivers after around 2 to 3 years. You will find this at any company. Have fun!